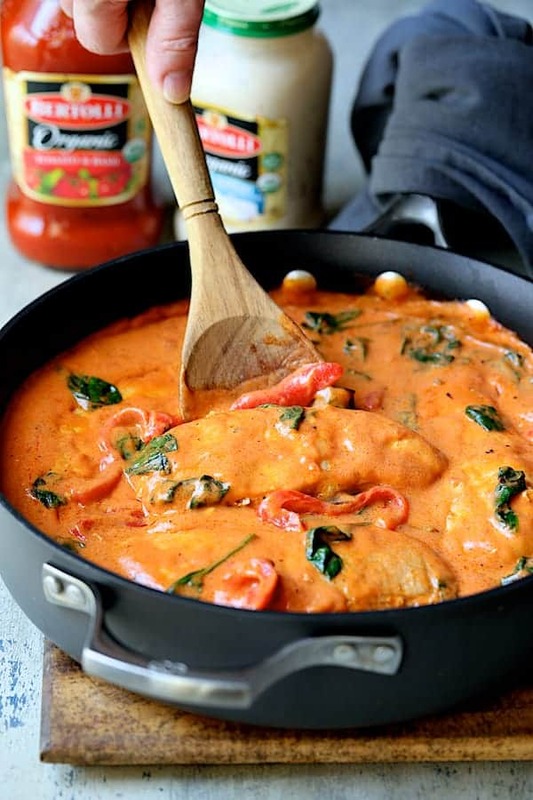 Chicken in Rosa Sauce with Roasted Red Bell Pepper and Spinach is perfect for your romantic Valentine’s Day dinner at home! 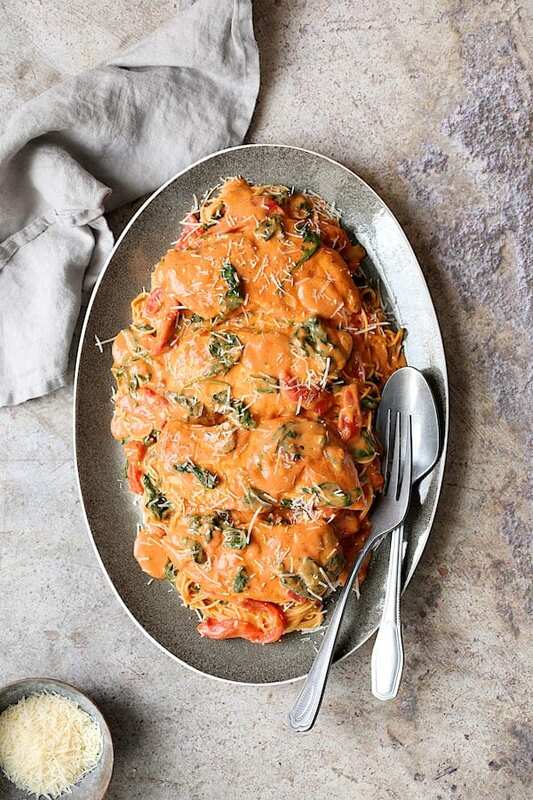 This simply delicious Tuscan-inspired meal will have you asking for amoré! Have you thought about what to do yet for Valentine’s Day? It falls on a weeknight so that complicates matters. After a full workday, you want something special yet simple to enjoy with your loved one. Read on because I’ve got the perfect Valentine’s Day idea! 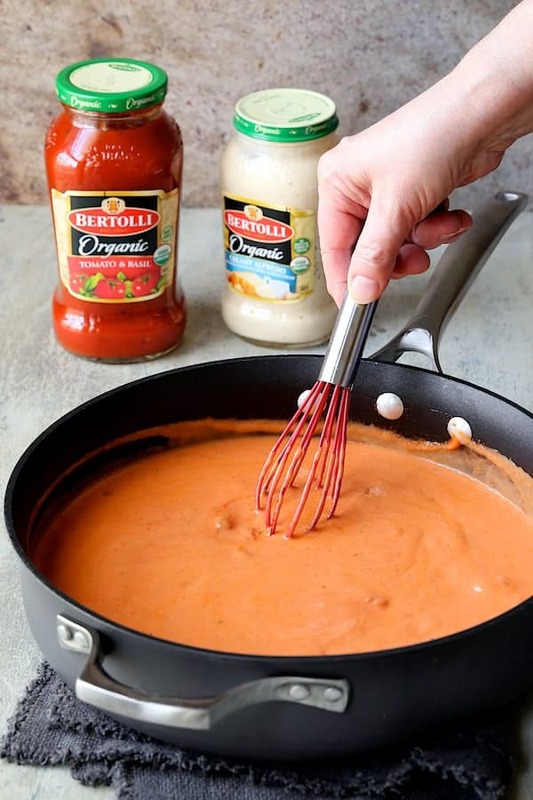 It’s as easy as combining one jar of Bertolli® Organic Traditional Tomato & Basil Sauce together with one jar of Bertolli® Organic Creamy Alfredo Sauce to create a delicious and savory Rosa sauce for instant romantic meal magic! 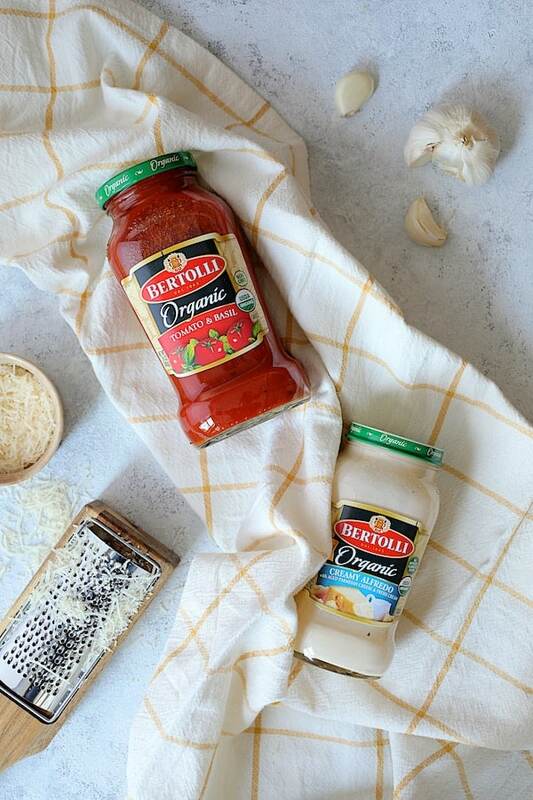 Although there are many Italian pasta sauces, there is only one from Tuscany–Bertolli®. 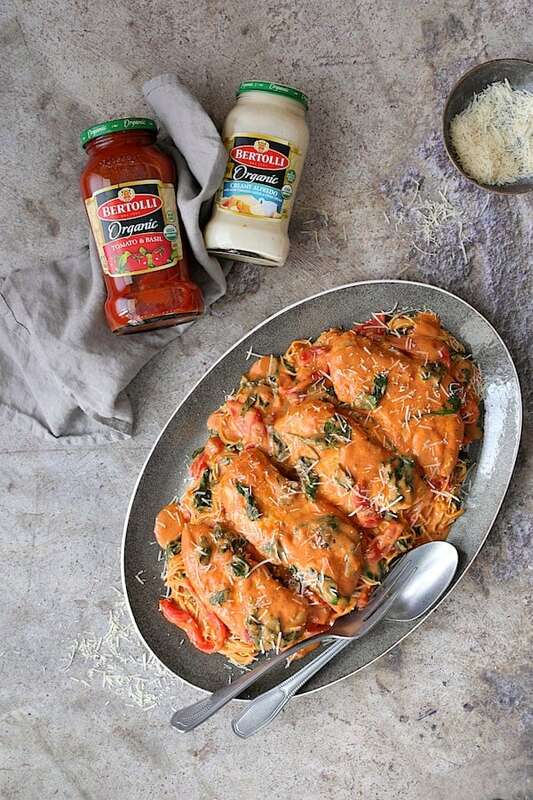 Bertolli® Sauces have a flavor as unique as the region where they’re born. 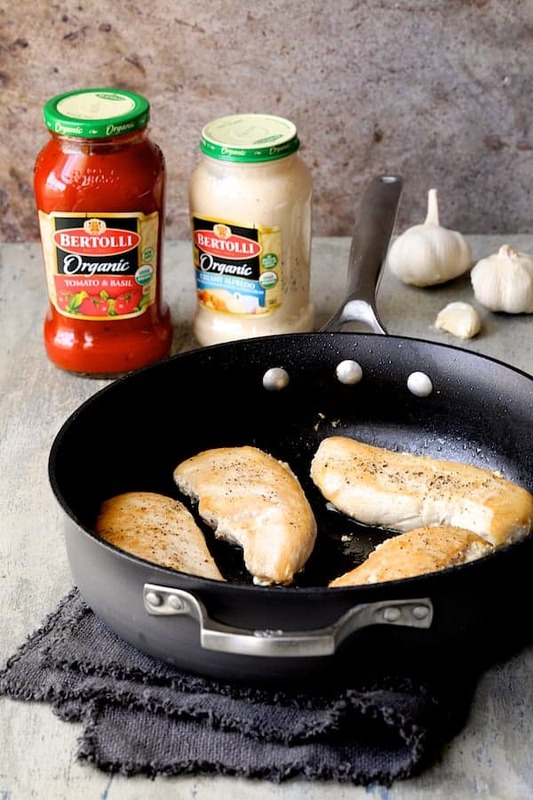 It’s the only premium sauce that is prepared simply and cooked lightly to lock in the layers of delicious flavor. 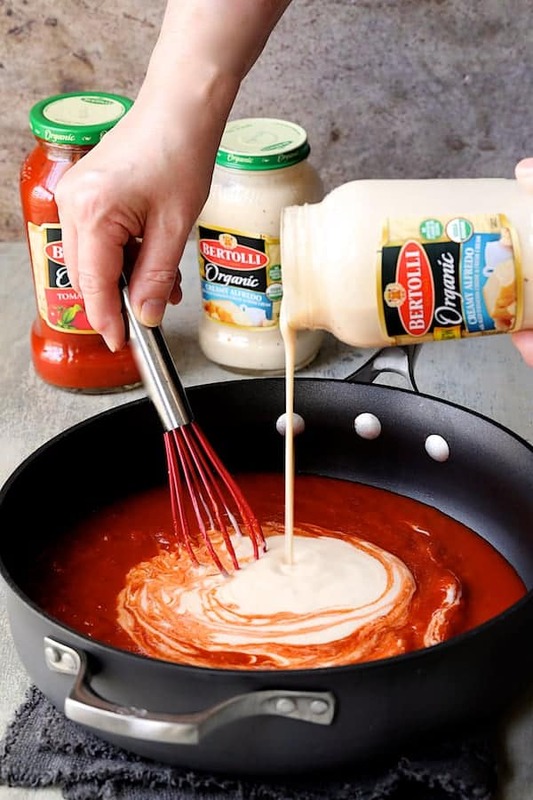 When you combine Bertolli® Organic Traditional Tomato & Basil Sauce with Bertolli® Organic Creamy Alfredo Sauce, the savory Tuscan-inspired possibilities are endless! It’s a delicious match made in simplicity! Perfect for a lovely Valentine’s Day meal at home! Aged Parmesan and Romano cheeses. 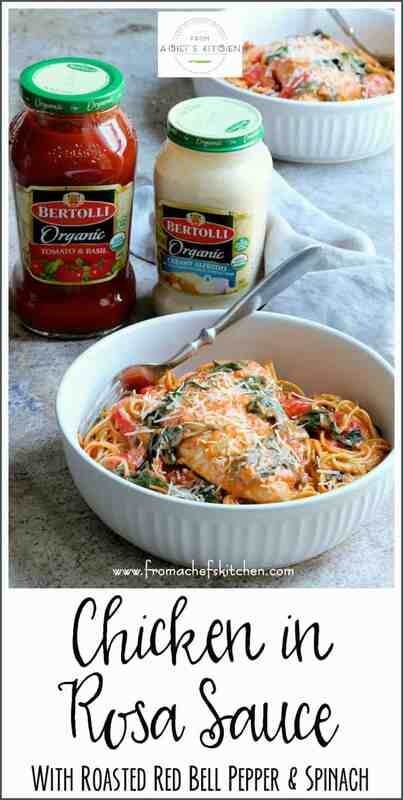 Both organic sauces bring rich, authentic Tuscan flavor to your table! Perfect for your Valentine’s Day dinner at home! After sauteing some baby spinach, brown the chicken then transfer it to a plate. Add the chicken back in and let it simmer a little bit so the chicken cooks through. Sprinkle on a little Parmesan or Romano cheese and serve! So easy and so elegant! There’s enough sauce in both jars to generously sauce four chicken breasts! So, if you can’t find a sitter because they all have Valentine’s Day plans and need more than dinner for two or celebrate “Galentine’s” instead, this dish is the perfect answer! 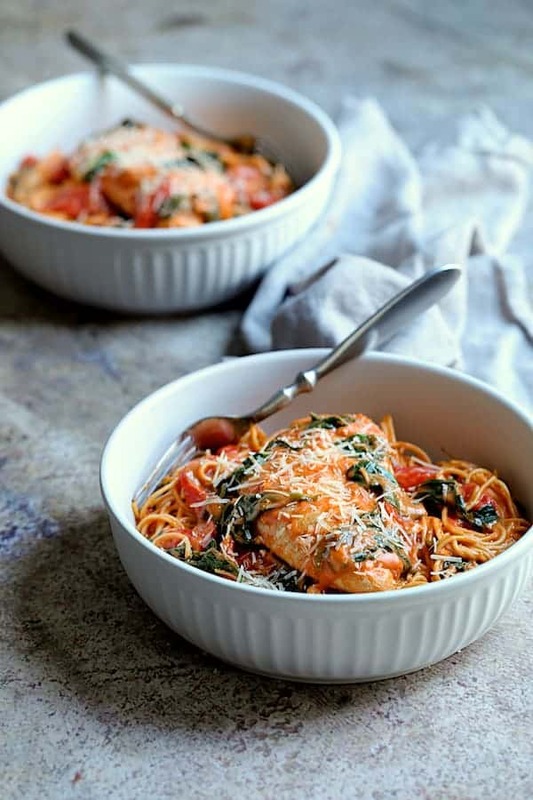 Chicken in Rosa Sauce with Roasted Red Bell Pepper and Spinach is perfect for your romantic Valentine’s Day dinner at home! 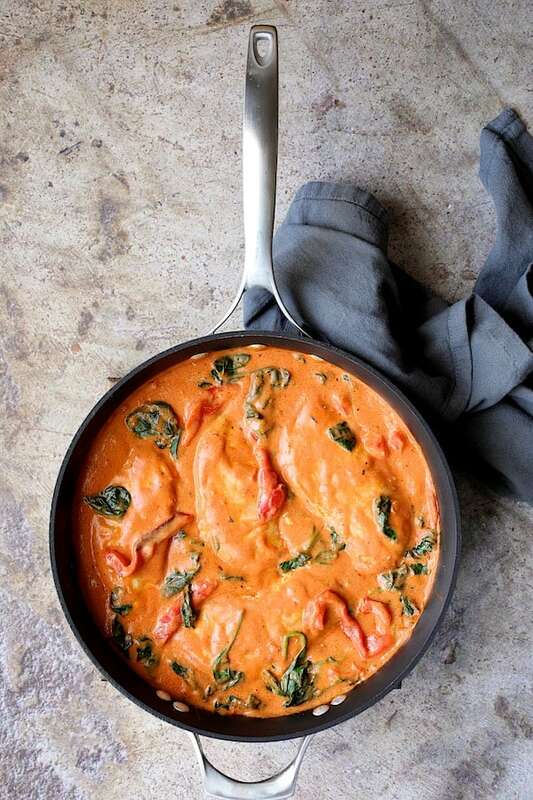 Chicken in Rosa Sauce with Roasted Red Bell Pepper and Spinach is perfect for your romantic Valentine's Day dinner at home! 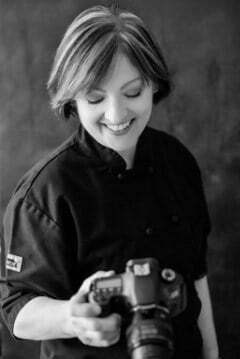 This simply delicious romantic Tuscan-inspired meal will have you asking for amoré! Heat 2 tablespoons olive oil in a large skillet or saute pan over medium-high heat. Add the spinach and garlic and cook 2-3 minutes or until wilted. Season spinach with salt and black pepper, to taste. Transfer to a plate and drain off any excess liquid. Heat remaining 2 tablespoons olive oil in the same skillet over medium-high heat. Season chicken with salt and black pepper. Brown the chicken on each side for 3-4 minutes or until golden. Transfer to a plate along with any drippings in the pan. 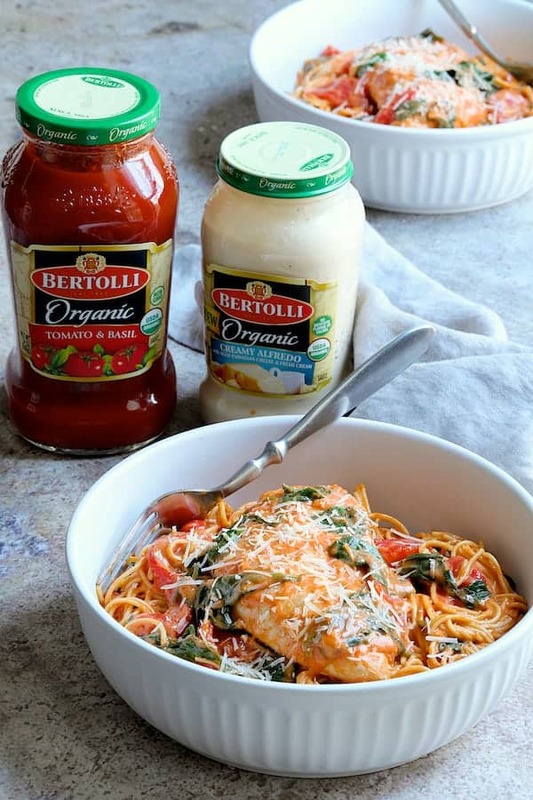 Pour the Bertolli Organic Tomato & Basil Sauce in the skillet (off the heat to prevent spattering). 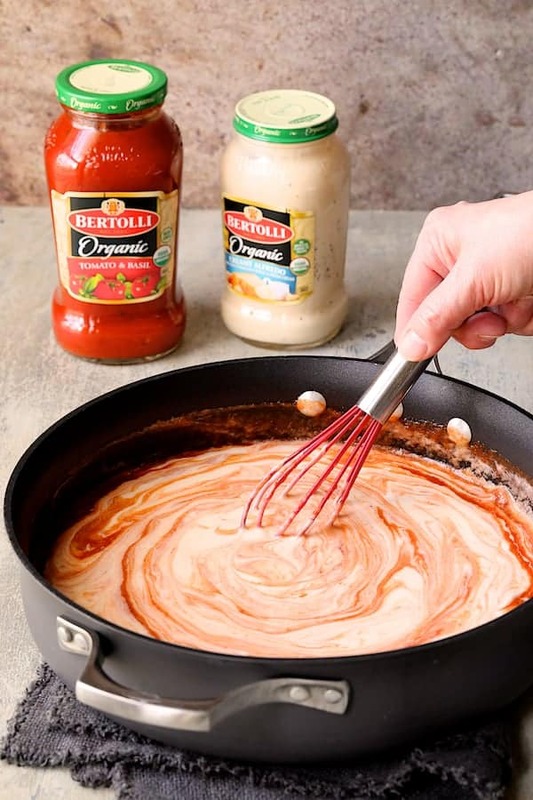 Then pour the Bertolli Organic Creamy Alfredo Sauce into the pan and whisk the two together to create the Rosa sauce. Place back on the heat. Return chicken to the pan and bring to a simmer. Simmer gently until the chicken is thoroughly cooked through to 165 degrees in the center, approximately 5-6 minutes. Add the roasted red bell pepper and cooked spinach and heat through. 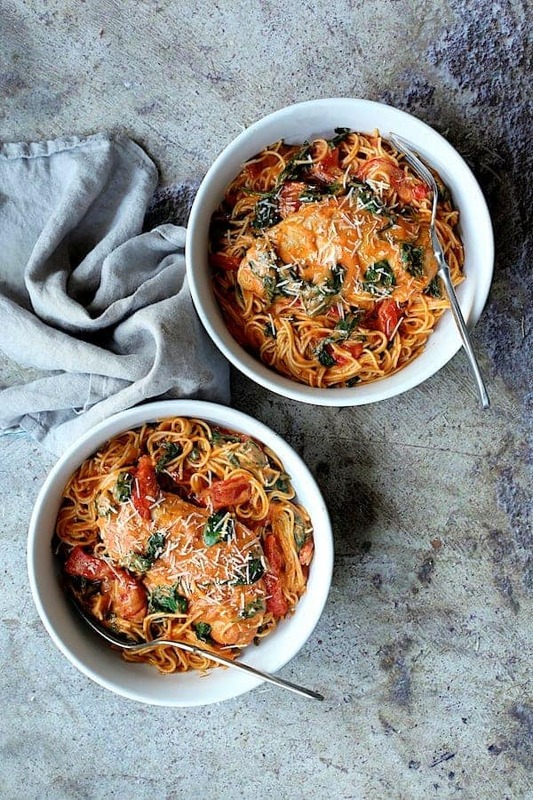 Serve with or over cooked angel hair pasta with freshly grated Parmesan or Romano cheese if desired.